The upcoming weekend forecast is for warm and glorious weather here in New England, a perfect time for getting out to enjoy the foliage. There’s leaf peeping, apple picking, corn mazes, pumpkin festivals, country fairs and more – we’ve gathered some resources to help you make the most of the nice weather. Yankee Foliage offers an excellent live foliage map and an extensive selection of suggested foliage drives. They also suggest the 5 Best Pumpkin Festivals in New England. New England Destinations is a good local guide, offering many ideas for the fall season, including a list of activities for September and October. 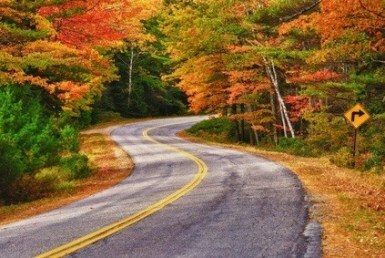 They also offer their own selection for foliage drives, as well as foliage maps and hotlines. If you want current tracking of the weather in this or any other season, Twitter can be a very fun way to do that. Meteorologists have a strong and active presence — many issue updated foliage reports and photos along with the weather. We have a list of New England Weather Resources on Twitter that you can follow. If you’re heading out for drives, we issue our seasonal caution to be alert for deer and moose. The Insurance Information Institute reminds us that fall is peak season for deer and auto collisions. “Deer migration and mating season generally runs from October through December, and causes a dramatic spike in the movement of deer population. As a result, more deer-vehicle collisions occur in this period than at any other time of year.” Plus, in northern New England, you need to be on the lookout for moose.